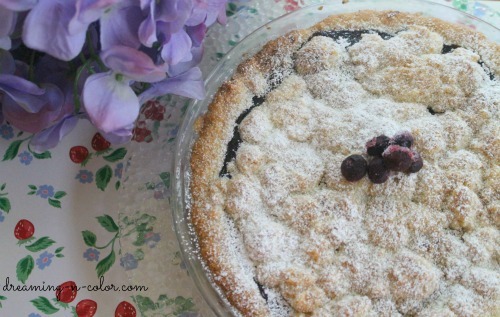 Blueberry Crumb Pie was the dessert I baked this past weekend. It is one of those oldie but goody recipes. You know, the ones you can count on being great and to take to someone's home. 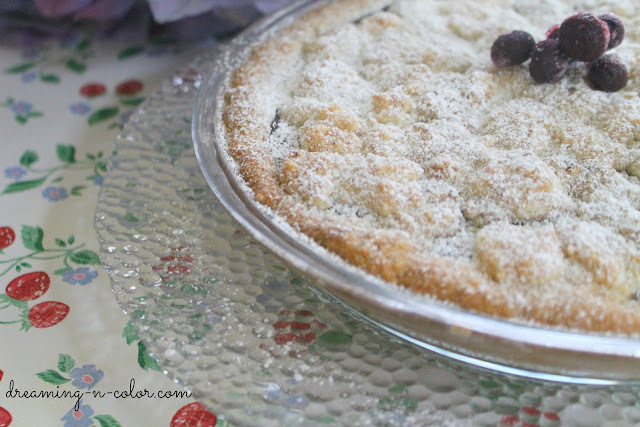 This pie has a story that goes along with it. With Mother's Day around the corner I thought I would share it. Nothing better than a recipe that has a story........ The best keepsake of all. My mom is one of the best cooks I know. My dad grows fresh fruits and vegetables in the spring and summer and she cooks them..... Every which way she can! I have shared her Basil Pesto recipe before on the blog. Not only does she cook great, she is a great baker. Growing up, my sister and I were always on a stool with a wooden spoon, stirring some great dessert my mom was baking. 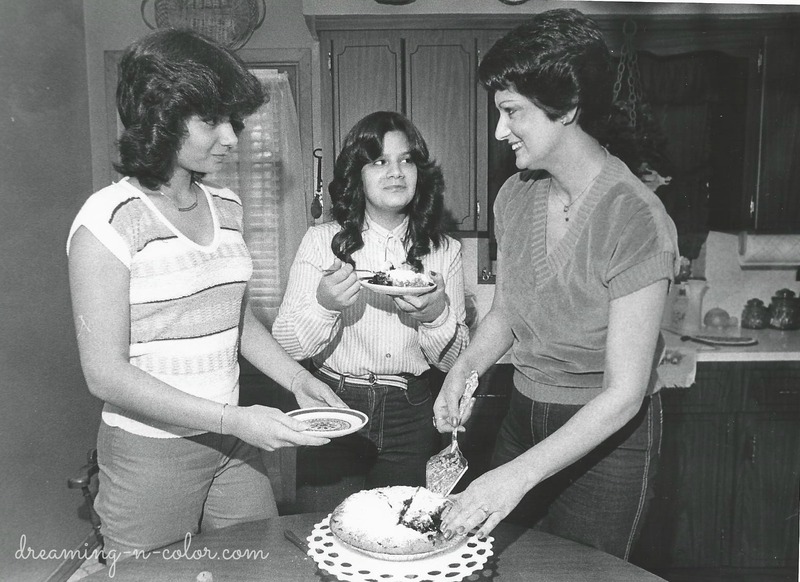 Most of my favorite recipes growing up were my moms! She could be a great food blogger if she would just do it! 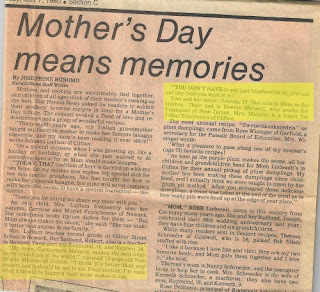 In April of 1980, my sister had an idea. The local paper was doing a contest for Mother's Day. We had to send in a recipe that our mother had created. 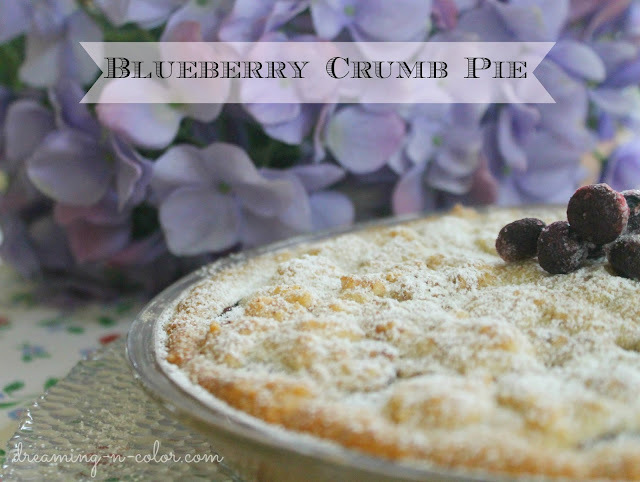 We loved her homemade Blueberry Crumb Pie! So my sister sent it in. In a few weeks the phone rang to say that my mother's recipe had been chosen as the winner! We couldn't believe it!! That was a big deal back then. I remember the photographers came to the house along with the news reporter. We posed for pictures and it was a real treat. We were famous.....at least for that weekend when the paper came out and our picture with the Blueberry Crumb Pie was in the Heralds News! It was one of those memories that last forever. And of course my mom saved it. So when we bake the pie....the story goes along with it. 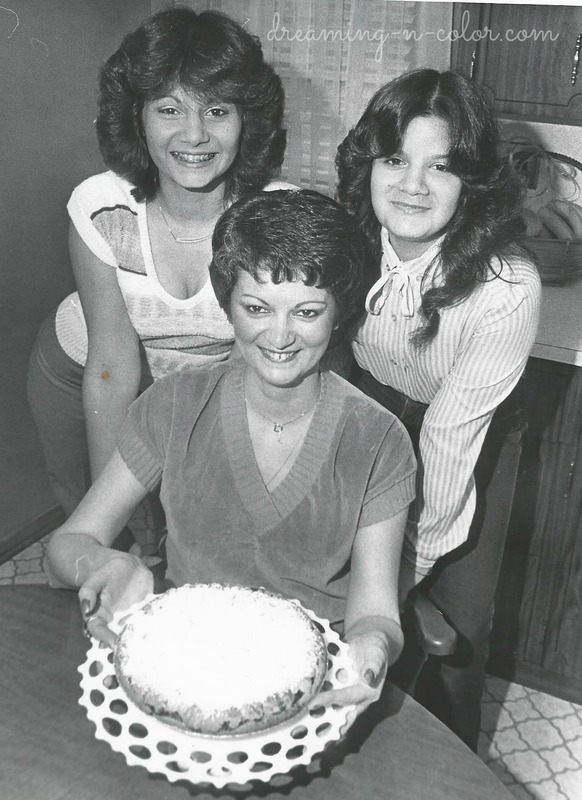 The day my mom won a blue ribbon and was famous! A double treat! ....and it is delicious! Never miss another one. Follow me here! What a wonderful story! I sat with my Granny and baked and still have her giant yelloware bowl that cakes were mixed in ...BY HAND! Good memories! those are the SAME kitchen cabinets we have!!! HAHAHA!!!!!! they are about to be gone for the most party! woot! What a beautiful story and such a great family memory. Love this story, so sweet and I bet that pie is too! Yum! Hi! I'm new to your blog and do a bit of baking too. Is the recipe a secret or you could share it with us. I'd like to try it. Thanks. Awesome story !!!!! I love the pictures too ! What a great memory ! I Love it when people share their stories about recipes or just their lives. You girls and your Mom are very pretty ladies. Can you believe there are still some of the older houses that have those cupboards. EEeeekkkk. Sure hope your Mom has nicer ones now. Even painting those babies didn't help them much. I've seen several homes on House Hunters with those cupboards. Almost as bad the cupboards mfg. homes have in them. We're living with them. I'd love to tear out the upper cupboards anyway but it's so dusty where we live everything would be dusty and grimy in no time. And that's with the windows closed even in Winter. Ah to dream. Are we ever happy with what we have? Happy week Deneen. I sure have changed since then! Thanks for stopping by. Those cabinets were beautiful...then. I remember having lots of them and they were brand new! Hi Deneen, What a fabulous story and memory maker. Love the paper pics. You girls all look like sisters with your mom. Gorgeous girls and having so much fun. Love the pic of the pie. Now I am hungry for a treat!! I love this story! And wow that pie looks fabulous! Beautiful pictures! Great Story - and I am saving the recipe! YUM! Oh...what a great story! You sound like you had such a wonderful childhood and admired your mother so much, and still do, I'm sure. I definitely want to try this recipe! I LOVE blueberry pie! And what a great story to go with it!